If you have organised an event for our Church, please send details for inclusion here, or contact the Church Office. Please check the current and recent newsletters for other upcoming events. Only a few major events are listed here! Tickets sold following weekend Masses. You place a bet at the tote table on whichever horse you think may win the race. You will be given a ticket for each bet. You can bet on as many horses as you want and on each horse as many times as you want. When all bets have been placed the odds will be announced at the start of the race. If your horse wins, you can collect your winnings from the tote table. 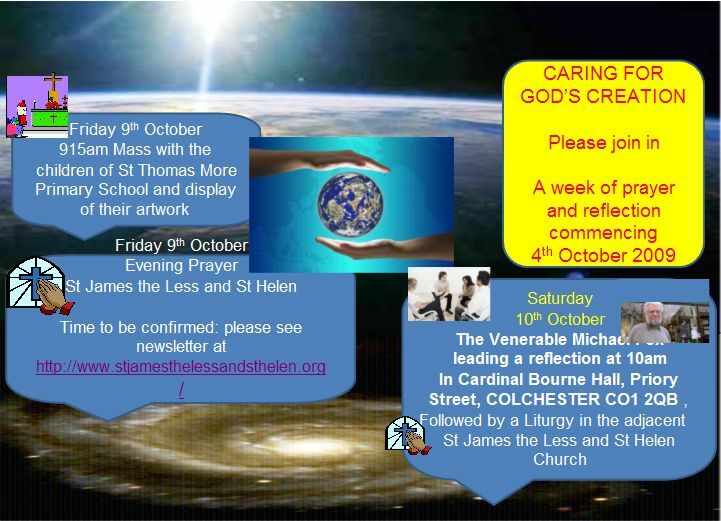 The SVP – helping those in need in your parish. Diocesan Pilgrimage to Lourdes 21st - 26th July, led by Bishop Alan. RCIA [JOURNEY OF FAITH] MEETING: Journey in Faith or RCIA is the process developed by the Catholic Church for those who are interested in finding out more about the Catholic Faith, teachings and practices with a view to becoming Catholics, or for those who have a background in the Catholic Faith but who have not yet been confirmed, or for anyone who wants to refresh their knowledge of the Catholic Faith. Sessions are held weekly from 7pm to 8.30pm on Thursday evening in the Crypt of the church. They will run from October until Easter. For more information, please contact cathy@dioceseofbrentwood.org, telephone 01206 735623 or speak to one of the Priests. An open evening to discuss course details was held on Thursday, 30th August at 7pm in the Crypt. The start date for 2018 was Thursday October 4th at 7pm and then Sessions are held weekly from 7pm to 8.30pm every Thursday evening in the Crypt of the church and these will run until Easter. Days of Reflection: These are Parish Days, or shorter periods, which provide an opportunity for focus on a liturgical season, e.g. Advent, Lent, or on a particular theme. They encompass presentations, prayer, discussion and periods of personal silent reflection. They are advertised in the Newsletter and have taken place in the Cardinal Bourne Hall, the Church Crypt or, as in Lent 2017, in the Church. PASTORAL VISIT TO PARISH: Bishop Alan visited our parish on Wednesday July 18, 2018 and celebrated the Sacrament of Confirmation at 7.30 pm. THANKSGIVING MASS FOR FR TONY: This took place on his last Sunday with us – 10th September, 2017 at 6:30pm and was followed by social get-together in the Cardinal Bourne Hall. On the Solemnity of the Most Holy Trinity, the parish community celebrated 180th anniversary of the erection of the parish and International day to reflect the universality of the church. Click here for more details. The Year of Mercy is a special time to go on Pilgrimage. 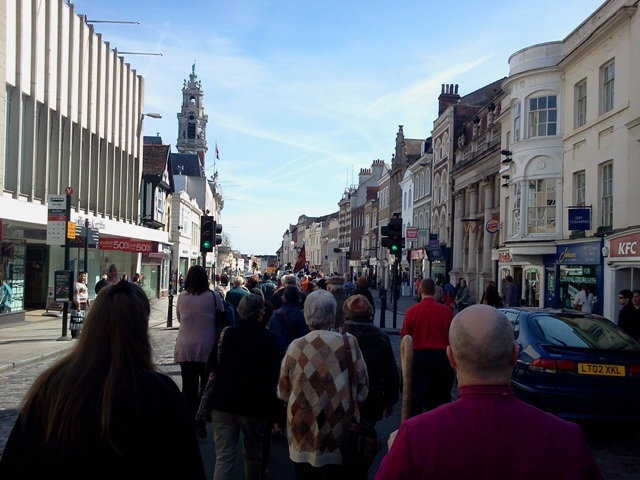 Our Bishop Alan Williams led the Pilgrimage in August. 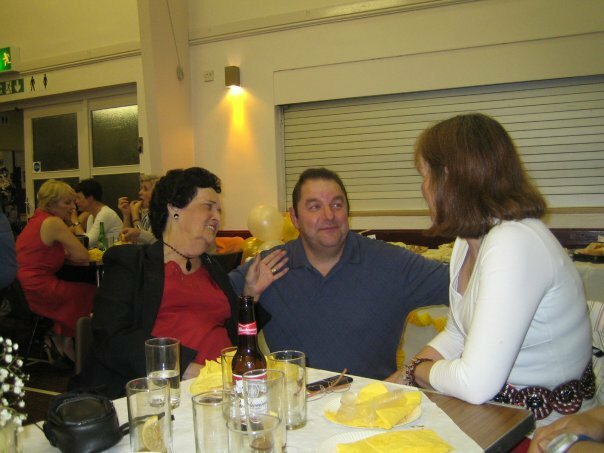 Fr Tony went and it was organised by our parishioner, Cathy O’Connor, as she has done for many years. The cost was from £639 by air with full board for 6days, 5 nights, or from £419 by coach. The pilgrimage included an experienced medical team and plenty of help for those with mobility needs. FILIPINO BUFFET: Many thanks to those who supported and attended the Filipino Buffet and for those who helped prepare the Hall, and for those who sung and danced! 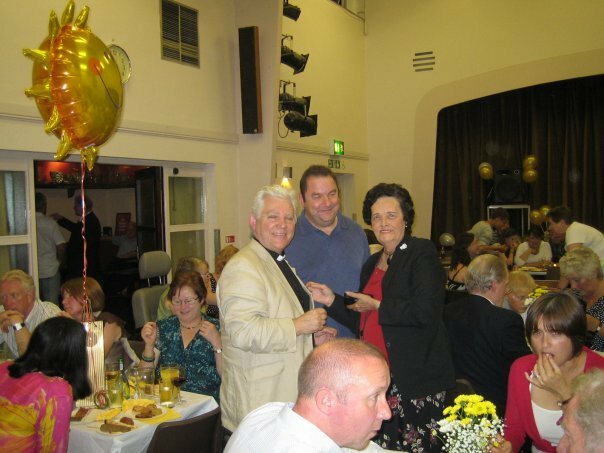 £400 was raised for parish funds. Amy and Armando. CHRISTMAS MARKET 2014: The final result of the Christmas Market, Christmas Draw and Curry Night is £3,889.09. Many thanks to all those who worked so hard to make this great result possible. Fr Tony. 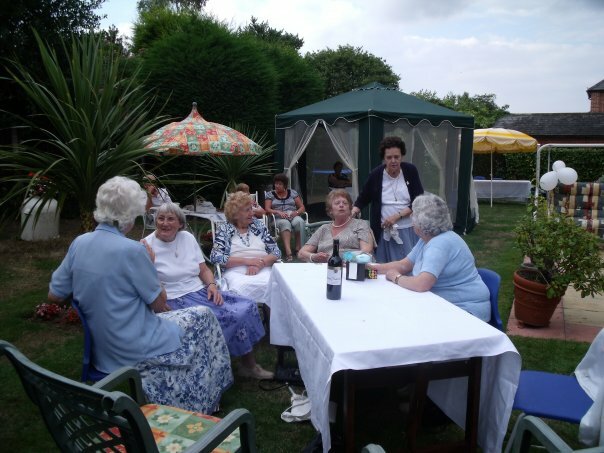 PARISH BBQ: Our 2014 parish BBQ raised £587.52. Many thanks to all those who supported this very enjoyable event. Thank you to the organisers and the cooks. Thanks to Frances, Nora, Armando and Amy, Marie, Juan. Not forgetting Ronnie H who ensured there were pretty flowers in the courtyard. FILIPINO FAMILY EVENING on June 21st 2014 Raised £318 for parish funds. A big thank you to everyone who came and to all those who helped in any way at all. From Armando and Amy. ST PATRICK’S NIGHT 2014: Thank you to all our supporters for making the 2014 event a great success. Thanks also to Sue Kelly for her home made breads. We raised £485. Best wishes from Frances, Norah, Pauline, May and Stuart. 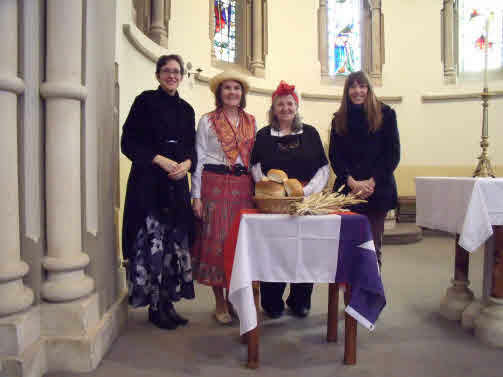 'Behold the Lamb of God' was held Saturday 23rd March in the Cardinal Bourne Hall. A very enjoyable experience attended by quite a few parishioners and Fr. Tony. Our thanks to Valerie Quinlivan for organising and leading this inspirational day. This event scheduled for March 9th 2014 was cancelled due to logistical problems. FRIENDS OF ST JAMES THE LESS: hosted a talk on the history of St John's Abbey on the 6th of October in the Cardinal Bourne Hall given by Philip Wise, Heritage Manager of Colchester and Ipswich Museum Service. An illustrated talk by Valerie Quinlivan on the historical and spiritual background of the 18 stained glass windows in our church. English Heritage Open Day from 6-9th September, 2012. See English Heritage Website for details. The following movie clips are quite large files. “TRANSITIONS”: Day of Reflection Saturday March 31st. 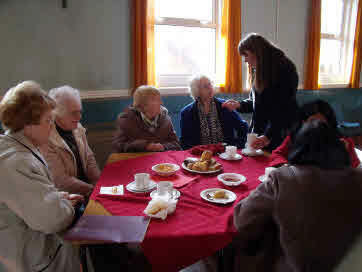 Over 25 parishioners attended this day led by Valerie Quinlivan. Bourne Hall. Live Irish music, dancing and singing. Homemade Irish stew, soda bread, apple crumble with custard/cream. Bar and Raffle. A great time was enjoyed by all. Thanks to Pauline, Armando, Frances and Nora and the rest of the team for their hard work. 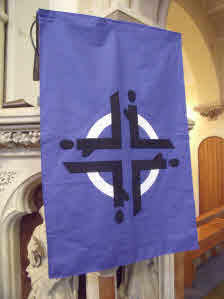 Services were held at St Johns Abbey Gatehouse Colchester in memory of Blessed John Beche Martyr. Fr. Tony presided and the BBC sent a crew to record the event. More details in the newsletter. St. James the Less was one of 34 historic buildings and churches open to the public on the weekend 10/11th September. Parishioners were on hand to show people around from 10.30 to 4.00pm on Saturday 10th and from 1.30 to 4.00pm on Sunday 11th. The event was a huge success with over 400 visitors registered and compliments received from the local Heritage representatives. We plan to participate in next year's event. A minibus will be going to Walsingham leaving East Hill Colchester at 8am. Details from Theresa Higgins on 01206-523501. A minibus will available from the Parish to Brentwood leaving at 5:15pm from the Gala Bingo. 15 seats are available. Details from Theresa Higgins on 01206-523501. Hunger Lunch in aid of Christian Aid. St. John Payne Parish Hall, Greenstead. 12-noon to 2-pm. 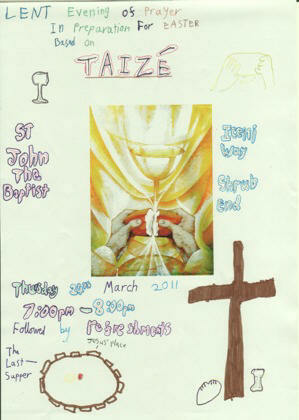 In preparation for Easter: 7pm to 8pm at St. John the Baptist Church, Iceni Way, Shrub End, Colchester. Followed by refreshments. 1) The Prayer Vigil in Hyde Park on Saturday 18th September. 2) Beatification of the Venerable John Henry Newman in Birmingham 19th September. Illustrated talk, Reflection and Discussion. This event was very well attended. Additional seats had to be found. Everyone said what a positive experience it had been. In the Cardinal Bourne Hall next to our main building in Priory Street Colchester. This event was very well attended, look out for announcements on future events. Evening prayer in the Church and follow-up talk by Michael Fox, "Creation and Incarnation". The event was a success with Father Tony and nearly 30 people attending. Thanks to Michael and everyone who attended for supporting this event. A meeting for ‘Welcomers’ & Potential ‘Welcomers’. For those who are involved (or would like to be involved) in the Ministry of Welcome. The notes of the meeting can be found here. Ivan and Anna Norfolk held a fund-raising tea on Saturday August 8, 2009. See more photos here: SVP Tea on Facebook. 20 - 25th July 2009 : Diocesan Pilgrimage to Lourdes. 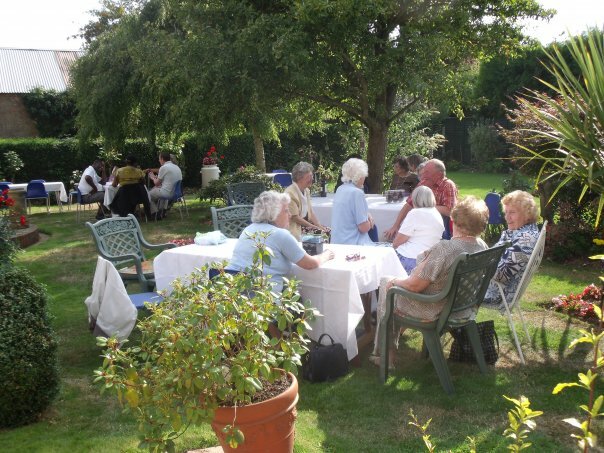 6th June 2009 : Diocesan Pilgrimage to Walsingham. 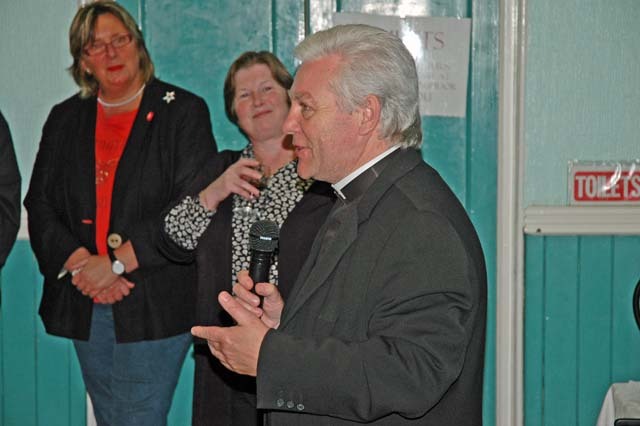 16th May 2009 : Catholic Deaf Association Pilgrimage to Walsingham. The Cavendish Consort presented "A Summer Garland" - music by Handel and his contemporaries, played on period instruments - on Saturday 27th June 2009 in the Church. 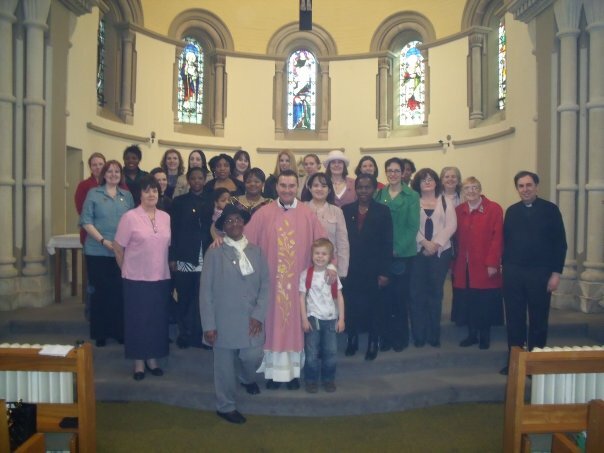 At Mass on March 22, 2009 we had the inauguration of the Union of Catholic Mothers branch in Colchester. The National President Maureen McCann was present as well as Sister Bridget, the National Recruitment officer. Leonore Sykes of St James the Less and St Helen Church is now the president of the Colchester Foundation, has been working hard to get this group formed. Lenore is front-centre with Father Brett Adams. Father Brett blessed the new Rose vestments which he wore on Sunday 22nd March, 2009 Laetere Sunday. 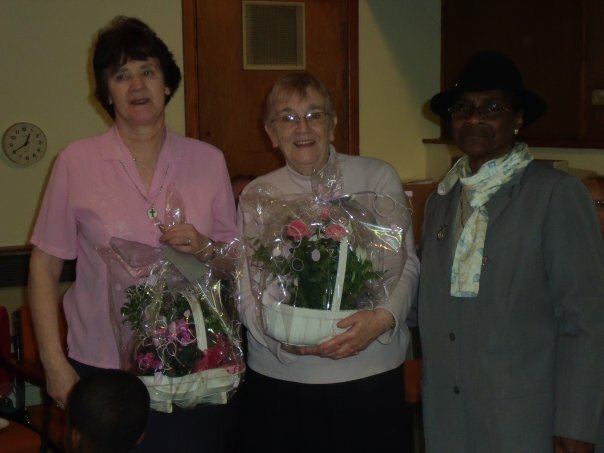 Sister Helen Walsh died peacefully 2nd March at St Joseph’s Hospice in Hackney. 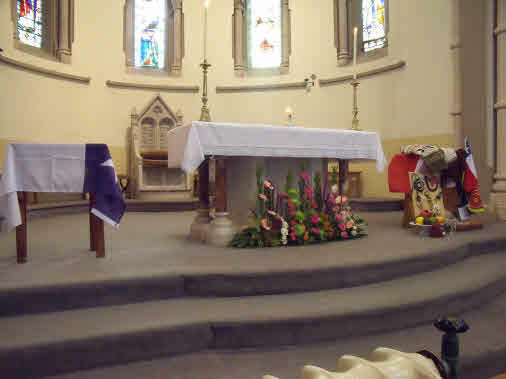 Her requiem took place at Our lady of Lourdes, Wanstead, Friday 13th March 2009. The film, ‘Son of Man’ – a showing of this ‘vivid, thrilling and awe-inspiring’ (Telegraph) version of the Passion, set in South Africa. 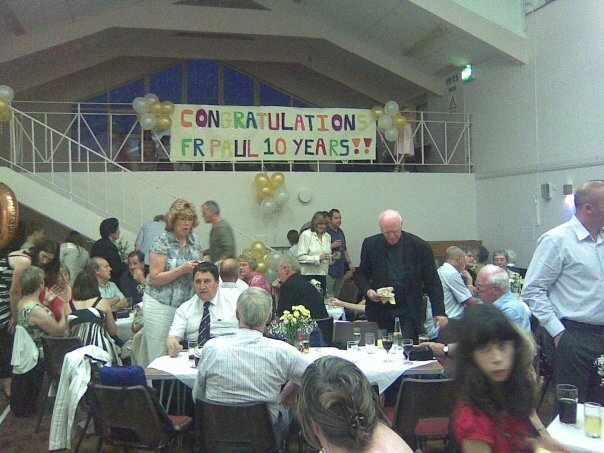 To celebrate 10-years in his parish. This took place 11th-18th May 2008. For more details see www.cda-uk.com or contact Theresa Higgins. 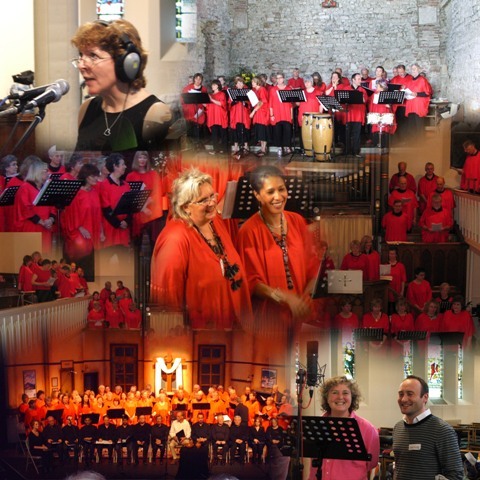 Held on Saturday April 26 at 7.30pm in Lion Walk Church Hall in Colchester’s town centre, Quire presented a very special concert entitled ‘SING PRAISE! featuring music from around the world to raise funds for the Mayor’s charities. 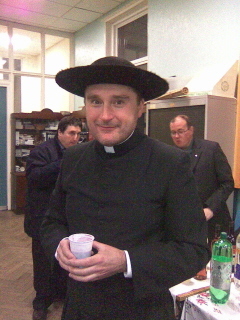 Father Brett Adams at a recent event in the Cardinal Bourne Hall. 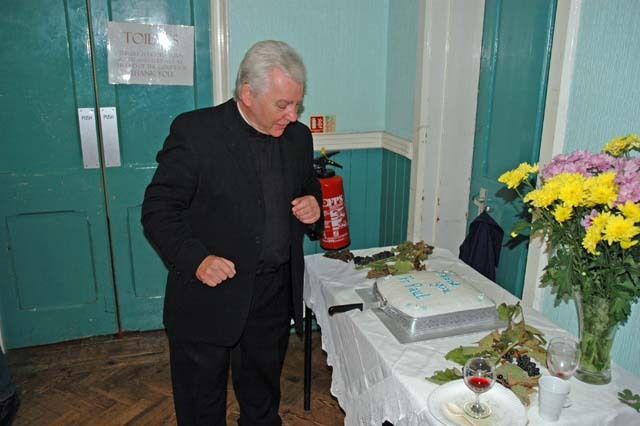 This picture of Father Brett was taken in the Cardinal Bourne Hall following the Easter Vigil Mass on 22nd March, 2007. 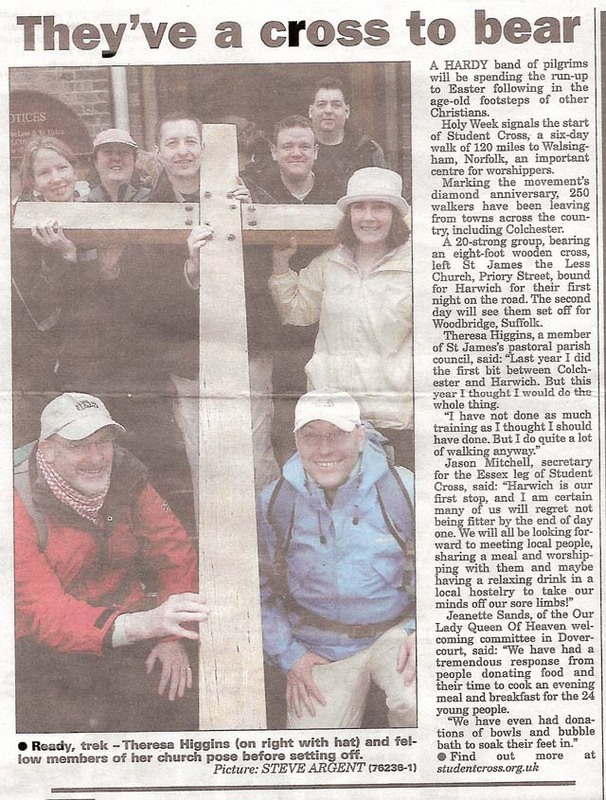 Members of our Parish taking part in the Student Cross walk to Walsingham in Norfolk. The Student Cross pilgrimage celebrated it 60th anniversary this year. 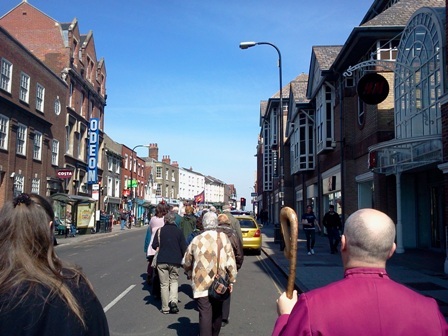 The “Essex leg” started in 1972 and departs each year from St James the Less and St. Helen RC church in Priory Street on the Saturday before Palm Sunday. 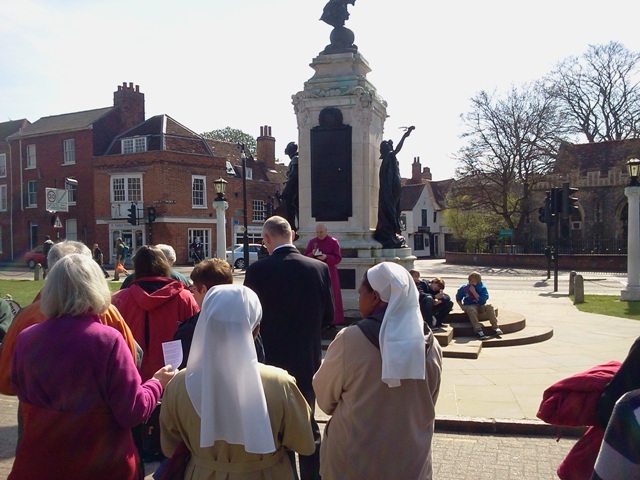 The Essex Leg, this year, had the additional honour of being the passion leg and enacted the Passion reading at the Good Friday service. Click on the picture to magnify the text in your browser window. Starting and ending at 48 Priory Street with Tea and Evening Prayer. Organised by Sister Diane. This took place after evening Mass at 7:30pm in the Hall. In our previous open meetings we have looked at involvement in our church, our parish and our community. More details will be put here shortly. In the Cardinal Bourne Hall, Priory Street, Colchester. These Days of Reflection are an opportunity to stop and be quiet for a few hours, before the end of summer rushes headlong into Christmas. The theme is God's Call to us in our daily lives. We start at 11am in the Cardinal Bourne Hall and finish about 3.30. Packed lunches advised. This event took place in the Cardinal Bourne Hall, Priory Street, Colchester. Hosted by Sister Helen Walsh and Valerie Quinlivan. The event was very well attended. Afterwards everyone said what a wonderful day it had been, and how grateful they were to Sister Helen who led the event despite undergoing chemotherapy. Father Paul Dynan's Farewell Event September 30, 2007 held in Cardinal Bourne Hall. Father Paul has moved to Basildon. The event at the Mercury Theatre in Colchester led by our Church was packed, and the performance by parishioners from our Church, together with Quire, Colchester’s sensational world music choir of 50 voices, were very well received by the audience. More information on the event will be posted here shortly. Sister Helen Walsh and Valerie Quinlivan. WEEK OF ACCOMPANIED PRAYER: an opportunity for support and guidance in prayer while continuing with daily life. A gift to yourself of time for reflection. This event was held Saturday 18th November in the Cardinal Bourne Hall. Over 60 people attended and we all had a wonderful time. If you would like to help organise or participate in next year's event, please contact Bernie on 549524 or Ron and Margaret on 797850. Sister Helen Walsh and Valerie Quinlivan. The event was well attended by members of the Parish community and all who attended were unanimous that it had been very beneficial to their spiritual development. A family barbecue was arranged for St. Helen's Feast Day on Friday August 18th after Mass at 6 pm on the suggestion of Father Paul. 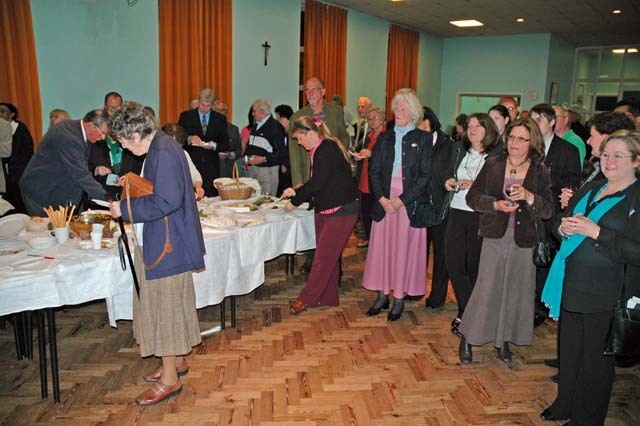 Our Annual Parish Meeting (APM) was held June 25,2006 in the Church Hall. 31 members of our parish attended. The minutes are available here: Minutes of 2006 Annual Parish Meeting. Issues raised at the APM were discussed at the Parish Pastoral Council meeting held June 30th. The Minutes of Pastoral Council meetings can be found here. A wonderful time was had by all at our annual St. Patrick's day social event. 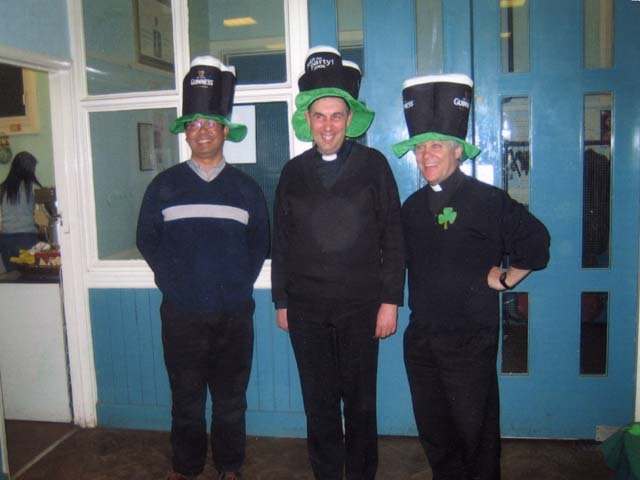 Judging by the picture, our priests enjoyed themselves too. From left to right: Father Widy, Father Joseph, Father Paul Dynan. Each week we publish an online newsletter.